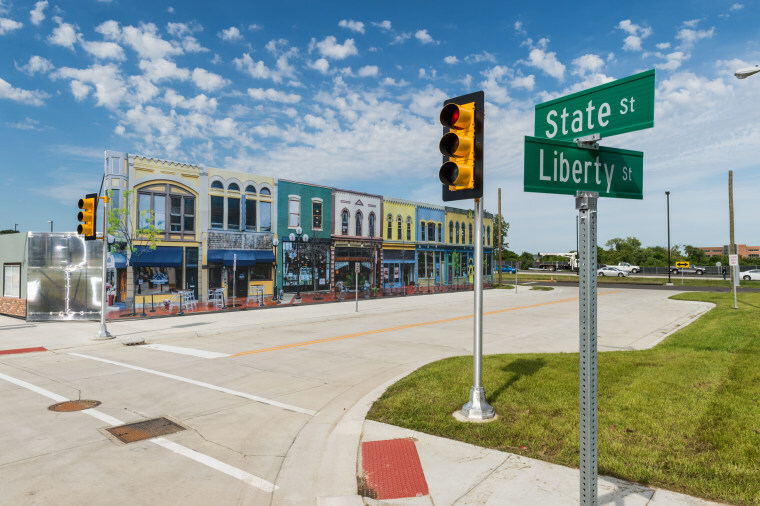 Michigan’s Mcity is a digital ghost town where self-driving vehicles can be tested without real-world risk. ANN ARBOR, MICH. — A self-driving car is driving past Liberty Street’s charming storefronts when a truck runs a red light. The car screeches to a halt, avoiding a collision by inches. Except that the truck isn’t real. And Liberty Street’s shops and restaurants are just a painted façade. Almost nothing here in Mcity is real, and that’s just the way Carrie Morton likes it. Mcity is a sort of digital ghost town that replicates almost any environment that today’s motorists — and tomorrow’s autonomous vehicles — might experience. Its 32 acres contain highways, ramps, tunnels, and roads made of concrete, asphalt, brick, and dirt. There are crosswalks, bike lanes, curbs, and fire hydrants, all surrounded by fake buildings and populated by eerily lifelike crash test dummy pedestrians. But the most important part of Mcity is invisible. Though its streets look to be empty of all but Mcity’s test vehicles, they teem with virtual cars, trucks, cyclists, and pedestrians. These can be seen on a computer screen in Mcity’s experimental car: a Lincoln MKZ updated with sensors, transceivers, and computers that make it both autonomous and connected. Carmakers are racing to develop autonomous vehicles to reduce the more than 37,000 road deaths in the U.S. each year — and give motorists the freedom to work, communicate, and even sleep on the move. But testing those vehicles isn’t easy. Loosed on real-world streets, they might not encounter a hazardous situation for months or years. And manufacturers and regulators are wary of testing new technologies using the public as guinea pigs. Mcity uses DSRC (Dedicated Short Range Communications), a system that lets cars communicate with each other and with traffic lights, parking spaces, and other infrastructure elements. DSRC-equipped cars continuously broadcast their location, speed, and direction, using wireless radio signals a bit like beefed-up wi-fi. The cars also listen for signals from other vehicles within a range of about 1,000 feet. So cars with DSRC can “hear” around corners for approaching vehicles or get an early warning if a car ahead stops short. Mcity has developed just such stoplights, which can even tell human (or robot) drivers when they’ll change. A computer-controlled car might turn off its engine during a long red, for example, or avoid a sudden stop if a green light turns yellow. At the moment, only one U.S. production vehicle — the 2017 Cadillac CTS — comes with DSRC. Mercedes-Benz and BMW have similar systems that use cellular signals, but there seems to be little enthusiasm among carmakers to move to a single standard. By demonstrating systems like the smart traffic lights that benefit cities and drivers alike, Mcity hopes to encourage the deployment of DSRC and make it a must-have feature for future vehicles. In the meantime, the system will allow Mcity to put cars in dangerous situations with virtual trucks, trains and pedestrians, without the risk of real accidents. In fact, Mcity has been so successful since it opened in 2016 that the Michigan Department of Transportation is working on a larger autonomous vehicle-testing site. When the 335-acre Willow Run project is completed, it will have a 2.5-mile highway loop for testing vehicles at high speed, urban and off-roads areas, a cyber-security facility — and probably a fleet of virtual runaway trucks.